Dubbed by Commonwealth Bank as Australia’s Leading Females Sales Trainer, Annette Lackovic’s grassroots started back in the fitness industry as a group fitness instructor at the young age of 15. By the age 21, Annette had transformed a struggling health club into a multi-million dollar money pit within a short period of 6mths, quickly making her realize she had a knack for sales and business. 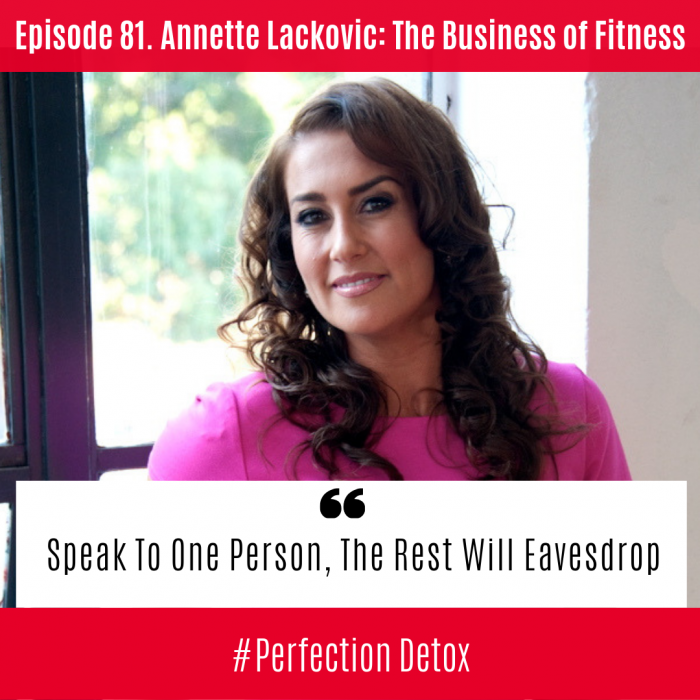 For the next 10 years, Annette trained thousands of business owners and gym staff, consulted to hundreds of health clubs and personal training studios with a big focus on ‘how to sell without being salesy’. A 13-year FILEX Conference speaking veteran, Annette is a thought leader from not just sales but her deeper passion, the link between positive psychology and human performance. Fast forward, today Annette keeps her finger on the pulse in the fitness industry by creating the very first online Sale Training University for health clubs (called S-Uni) allowing clubs to have their team trained up in sales and reduce the expenses of continual sales training. Annette continues to be on the speaker circuit across the nation speaking on sales, wellness, and unstoppable personal performance. Annette and I met at an amazing event in 2018. It was called Iconic 2.0 with Ali Brown and took place in Phoenix, last November. We connected immediately, although at the time, I had no idea that Annette also had a long history in the fitness world. Annette’s fitness journey started when she was 12. Her sister used to teach aerobics in a local community hall and Annette would turn up and do the class with her. By the age of 15, she knew this was going to be a part of her future. At 17, Annette took her fitness certification and, like many others, it was when an instructor didn’t show up that her career began. At this time Annette lived in a little country town called Springwood, which is in the Blue Mountains, about an hour and a half out of Sydney. Annette was taught by her mom that she could do anything, and with that came a lot of power. Annette shares the importance of having someone that believes in you at an early age, and how it can make such a difference as we get older. As well as teaching fitness, Annette was a master at selling club memberships. She shares that she fell into sales and believes she was good at it because she loved people. It was her drive to help people get healthier, and show them how happy they could be through exercise, that ramped up her success in sales. Through another no-show, Annette moved into management even though she had no management experience, but through the mentorship of another salesperson, she fast-tracked her success. Through her mentor, she learned the psychology on why people buy and this helped her systemize communications, that in turn helped other people follow a process to successful selling. By putting a framework around a method on how to lead people through their goals, and to show them how fitness is the solution to whatever problem they’ve got, returned rewarding results and great success. Annette believes that a lot of personal trainers go into a sale without any structure. They hope that they’re going to talk about the person’s goals and the person’s going to convert. But if we can come from a place that is really all about the customer, not about us, and not about getting the money, the transformation will be huge both for the customer and for us. Annette shares that she was an intuitive salesperson, so while she didn’t know what she was doing she was still successful. But it is when there’s a process in place and you can bring in the Law of Connectivity that you will see improving results. Annette explains that the Law of Connectivity means when that we shape an area of someone’s life, such as weight loss or their health, it has a ripple effect into other areas of their life such as relationships, business, and work. Annette suggests when it comes to sales we do a consultative approach, which means we asked the small questions first that open the door to letting the customer tell us what they need, not what we think they want. A consultative approach also means you need to have a stack of questions ready so that you can find your ideal customer and help them to find their number one priority. What are the areas in their life that can be helped by fitness that on first glance may not seem connected? How long has that (way of being) been going on for? What’s the ripple effect of that? How, how would that continue to make you feel? And at the same time, if you come from a place of service and you’re really sitting there looking at that other human being saying, I’m truly here to help you train for the good of you, they will feel the difference and be motivated to buy. Annette tells us how to test the buying temperature. She likes to call them tick questions. These are the little questions that you can ask, which allow the customer to see themselves inside the vision of the future. These small tick questions help the customer make little decisions before the big decision. When it comes to any type of selling Annette shares that we have to get out of our head and more into the connection. She goes on to explain that structured questions give the customer freedom, and at the same time helps us decide if the person in front of us, is the right fit for us. Just like anything, these questions and a strong sales process takes practice. Annette says you need to practice your questions in front of the mirror, in the shower, in the car. This way, you have them so dialed in, that when you are in front of your customer they’re in your subconscious brain allowing you to be totally present as you listen to their answers. We move into talking about ways to scale our business, in particular, the online model. Annette believes that if you are wanting to expand your business, that you will need to learn how to do online marketing or outsource it so someone can help you. The links to some of the resources we talked about can be found at the top of these show notes. Annette also reminds us to feel our own compass and find quiet time. Because we are often so caught up in our day to day, we can’t feel the magnetic pull to where we need to be. Getting still will allow you to ask and feel where the next step is. Tap into where your next move will need to happen and ask yourself, “ What am I actually feeling?” When we don’t have that quiet time, we can’t actually hear and feel where we are and where we should be going. Find out where that true north is. Normally it’s some big bombastic goal that scares the heck out of you, but that is what you’re born to do. And then it’s learning what are the steps that you need to do to get there. We close the show with Annette giving advice on how to find clarity. She invites us all to go and take a moment to reflect on your perfect work day and then write it down in detail. Write down how your perfect work day would run from the moment you wake up to the moment your head hits the pillow. We finish by Annette encouraging us to get out of our head and into the world and reminds us to always come from a place of gratitude. To continually just focus at the end of every day on the things you are grateful for and then take five minutes before you go to bed to journal on how are you feeling and what your goals are. These two things will help keep you moving forward and in alignment with your true north.